To commemorate Women’s History Month, The Phillips Collection will be celebrating female and female identifying artists during the entire month of March. 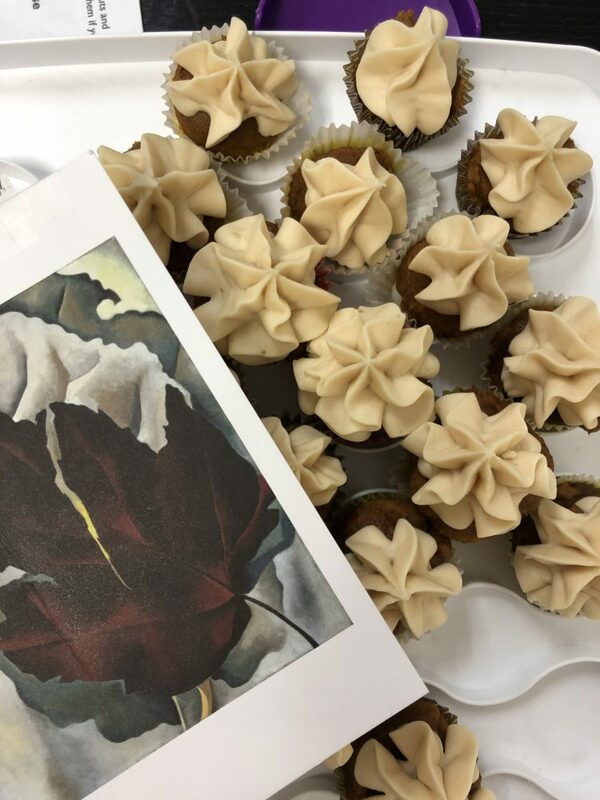 As a part of her “The Phillips Dozen” project, Phillips Museum Assistant Emily Rader creates delicious cupcakes inspired by works of art in the permanent collection. 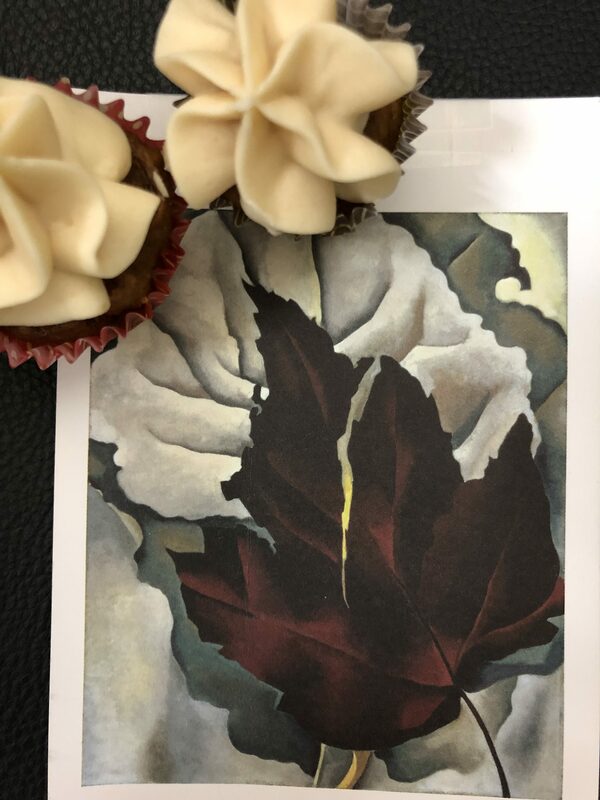 Recently, staff got to enjoy pumpkin cupcakes with a maple cream cheese frosting inspired by Georgia O’Keeffe’s Pattern of Leaves. Flour, Puréed Pumpkin, Sugar, Brown Sugar, Buttermilk, Vegetable Oil, Baking Powder, Cinnamon, Powdered Ginger, Nutmeg, Cloves, Allspice, Salt. Confectioners Sugar, Cream Cheese, Maple Syrup, Brown Sugar, and Butter. This work is an olfactory sketch of Georgia O’Keeffe’s Pattern of Leaves. The focus on a single key flavor in this work follows the teachings of Arthur Wesley Dow, O’Keeffe’s most influential teacher. His theories focused on “simplifying and isolating form to reveal its essence”. (PC) This amuse-gueule’s focus on a central motif, maple, is a way of referring back to the original work’s focus. The flavor is made more vibrant by layering maple and similarly tonal flavors like pumpkin and molasses. The choice of pumpkin is especially significant as a way of representing an artist from the Americas’ work. The earliest evidence of domesticated pumpkin was in Oaxaca, Mexico (over 7,500 years ago) and it was vital to the diet of both the early settlers and the Native Americans. This versatile vegetable, much like O’Keeffe herself, also takes on the flavors of its locales. Georgia O’Keeffe stands as the representative of Gallery 291 and the other Alfred Stieglitz supported artists. Stieglitz brought the European avant-garde, photographers, and American Modernism to greater awareness in America and a significant portion of the Phillips’s collection is dedicated to artists he promoted. Description and recipe by Emily Rader. Follow her on Instagram. Valeska Soares (b. 1957, Belo Horizonte, Brazil) is a Brooklyn-based Brazilian sculptor and installation artist. 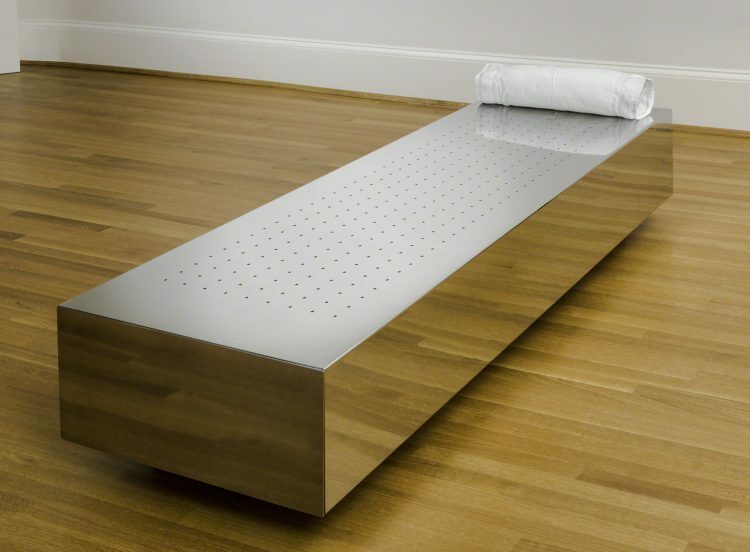 Her work varies with a wide range of materials, such as stainless steel and mirrors, antique books and furniture, chiseled marble, bottles of perfume, and fresh roses and lilies. Most of her experiences stem from her training in architecture as well as minimalism and conceptualism. Her works invite viewers to engage all five senses, evoking the poetic and elusive themes of desire, intimacy, language, loss, personal memory, and collective history. Her conceptual techniques are used to create environments and experiences that are inviting yet disturbing. Some of her works were inspired by her favorite novelist Italo Calvino. 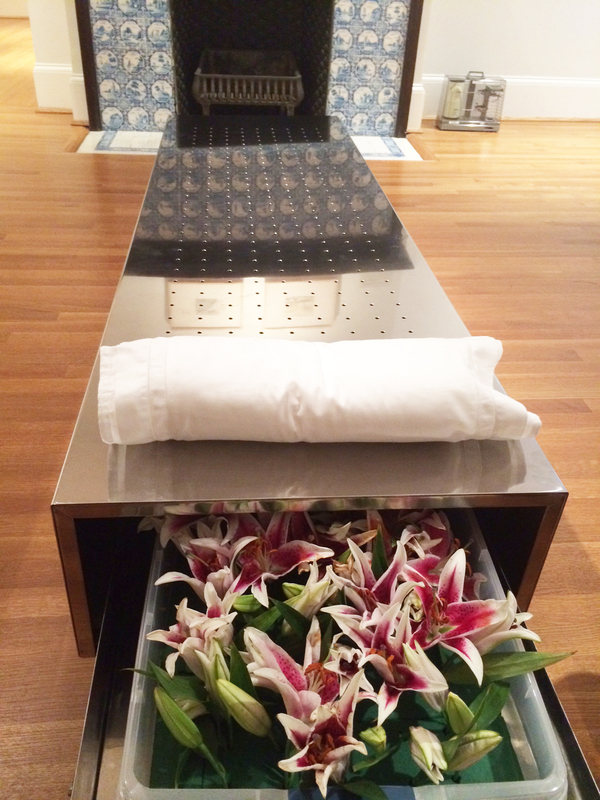 Soares’s Fainting Couch in the Phillips’s collection is a multisensory work that invites visitors to repose on a stainless steel chaise as they take in the heady olfactory notes of real stargazer lilies—60 to 80 blooms in all—which are stored in drawers built underneath the metal seating. In order to maintain the pleasant aroma, the lilies must be replaced on a weekly basis. Soares first achieved international recognition with her participation in the 1995 edition of SITE Santa Fe, shortly after she moved to New York from Brazil. 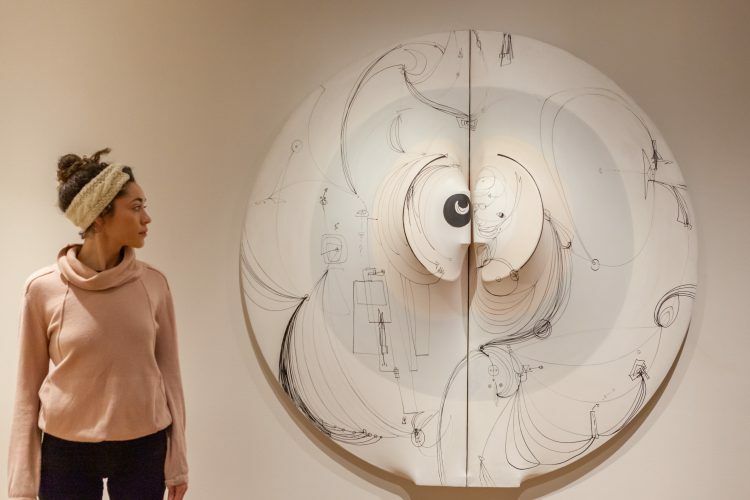 Her works have been exhibited at the Jewish Museum in New York; the Museum of Fine Arts in Boston; the Sharjah Biennial in the UAE, and more. To commemorate Women’s History Month, The Phillips Collection will be celebrating female and female identifying artists during the entire month of March. Zilia Sánchez: Soy Isla (I Am an Island)—the Cuban artist’s first museum retrospective—is on view at The Phillips Collection February 16-May 19, 2019. The moon (or lunar) is a common theme in the work of Zilia Sánchez. Her Lunar paintings and sculptures bring an elusive, symbolic content to her work. As she recalls her memories of growing up in Havana, she explains, “I cried a lot when I was little and the only way for my mother to console me was to take me outside to see the moonlight.” This soft and calming light when day turns into night continues to give Sánchez a sense of comfort and well-being throughout the years. The moon universally marks the passing of time and is often associated with feminine principles. With its soft glow, the full moon is a symbol of subtlety, reflection, and quietude. 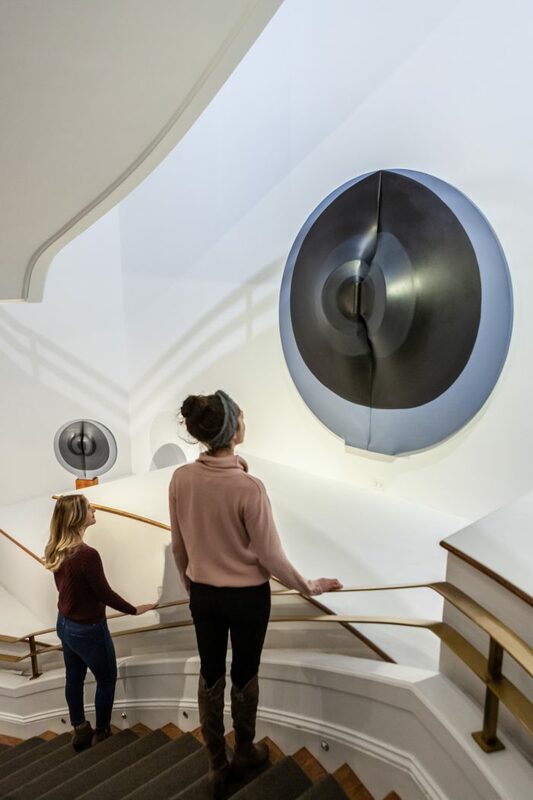 In Spanish, the word lunar has a double meaning, referring to either a mole/beauty mark or to the moon, thereby underlining the synergy of the body and nature, the personal and the cosmic, that is present in many of Sánchez’s works. “Lunares have sensuality and sexuality,” says Sánchez. “They are marks of beauty.” While some of the Lunar pieces emphasize the purity of circular forms in white, blue, and gray, others bear tattoo drawings that trace cryptic trajectories. Reflecting on her Lunar works, Sánchez frequently mentions the Caribbean moonlight—la noche lunar—that brings her tranquility.